Sometimes it’s unclear whether Wisconsinites are called cheeseheads because of the Packers-related headgear, or because we just eat so much cheese. While we're not known for being picky about the form our cheese takes, fried is king in Wisconsin, and curds are a local delicacy. The fresh, young cheddar cheese is mild, and is the perfect size and shape for frying. 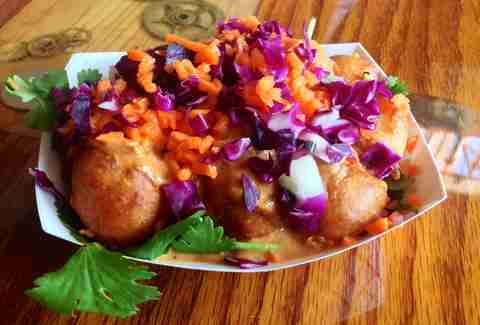 Here are the best spots around Wisconsin to indulge your love of cheese curds. 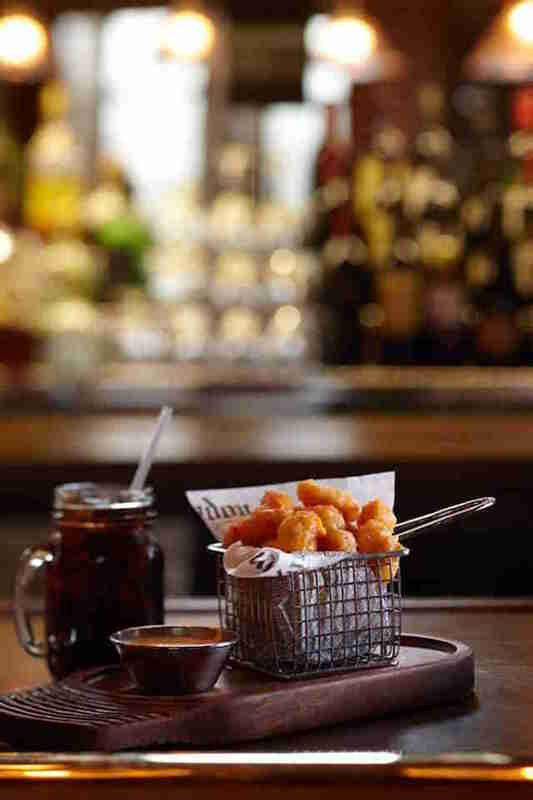 The Old Fashioned on Madison's Capitol Square is known just as much for its cheese curds as it is for… well, Old Fashioneds. You order by number at this spot, and these guys fall at lucky No. 13… which is what you’ll be feeling when these beer-battered beauties arrive at the table. They tend to be small curds, which makes them great for tossing them in your mouth like popcorn -- and you'll eat them just as quickly. 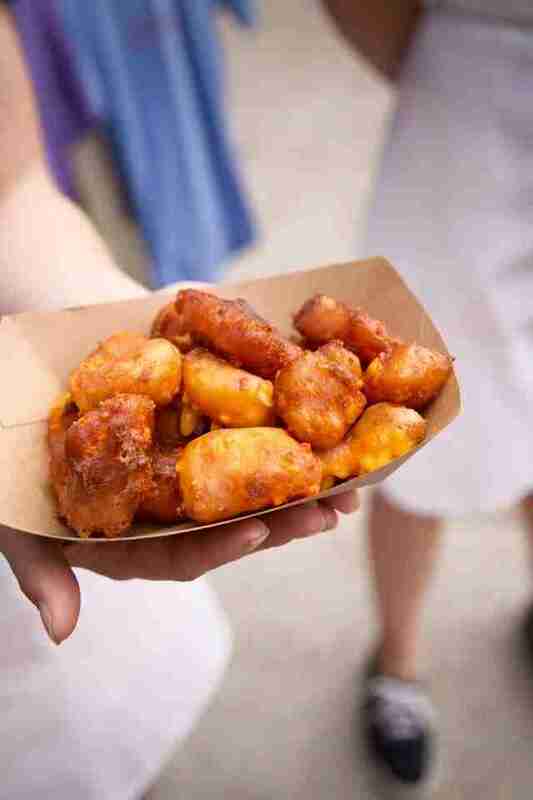 Yes, they're only available 11 days a year, but the cheese curds at the State Fair are amazing. For the best, look for the Hot Wisconsin Cheese cart that's always parked on the north end of the cream puff building. They have a light, crisp batter coating, and there's always a line, so they're fresh. 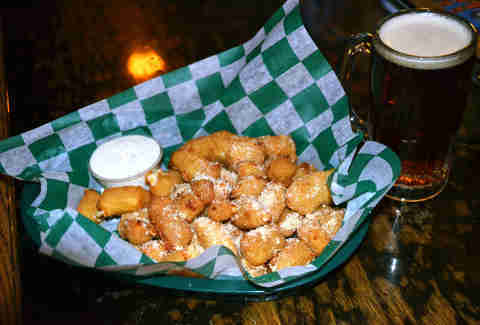 What better way to celebrate America's Dairyland than with some deep-fried cheese? 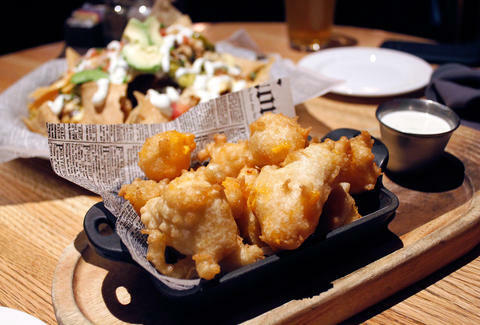 This brewpub serves up some of the best curds in Green Bay, where cheeseheads reign supreme. 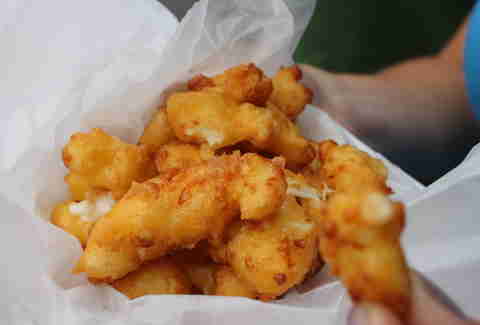 Renard's Cheese in Sturgeon Bay provides the curds, which are fried here in a light, puffy batter. They're served with tomato sauce for dipping, which is superior to ranch in almost every way. These are perfect for soaking up all the beer you tried on the brewery tour. Located inside The American Club hotel in Kohler, this sports bar serves up what may be the best cheese curds I've ever had. The big curds are fried in a beer batter coating that's substantial enough to hold the melted cheese in, but light enough that it just melts in your mouth. All the little crispy batter bites are great for dipping in the homemade buttermilk-based ranch. While WI is the land of cheese, it's also the unofficial home of the bratwurst, so naturally, we put them together all the time. The encased meat emporium of OSS churns out some puffy, crispy curds that are best when dipped in Sriracha mayo… just try not to top your sausage with cheese curds, I dare you. 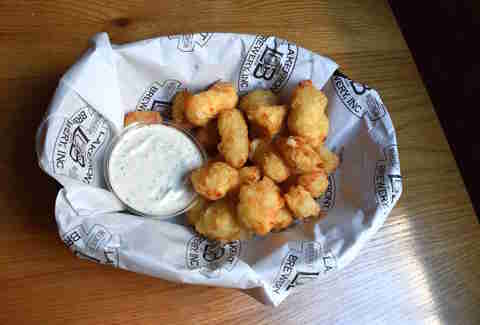 Lakefront's beer hall might be best known for its Friday fish fry, but the curds should not be overlooked. The curds come from Clock Shadow Creamery, the first urban cheese factory in Wisconsin, and are fried in beer batter -- duh -- flecked with pepper. They’re perfect with the live polka music in the hall. You can't get much fresher than frying cheese curds right at the source. This cheese factory produces tons of curds, many of which get fried and served up in its retail shop. Thin, crispy batter barely contains the cheese, which is so fresh it often still squeaks in fried form (let them cool down a bit for optimal squeak). Bonus: you can grab a foam cheese can koozie and fresh curds for the road. You can get a full-on cheese meal at the Brat House: beer cheese soup, cheese curds, and a Usinger's brat topped with cheese. The curds have a light batter coating, and are topped with Parmesan... because what better way is there to garnish cheese than with more cheese? Plus, you can also get your curds tossed in buffalo sauce here. Mmm. Food carts are a big deal in Madison, and this cart, serving only fried cheese curds, is in high demand. The batter around the curds is fried until it's a deep golden-brown, with super-crunchy little bits and pieces. Homemade sauces for dipping include ranch and Sriracha aioli. Find them on the Square at the farmers market. 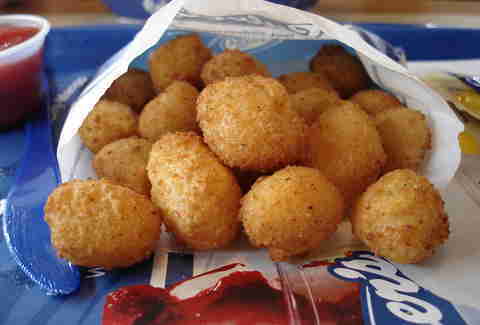 You're never far from a cheese curd in Wisconsin thanks to Culver's, our homegrown fast-food empire. They don't take the typical shortcut of using regular cubed cheese like you might expect from a fast food place; they actually use Wisconsin cheese curds, specifically from LaGrander's Hillside Dairy in Stanley. And you know what? They're pretty darn tasty. I especially like the fact that they mix white and yellow, which makes for a fun guessing game on boring road trips. Lacey Muszynski is a Wisconsin native who actually prefers her cheese curds fresh, not fried. Tell her how wrong she is on Twitter @worthhersalt.